It’s another Fishy French Friday! We are really get down to the final recipes. There are some iffy ones left, but also some really good-sounding ones. I am looking forward to trying them all! This week’s recipe was a little iffy-sounding to me. Pureed fish soup? It was hard to get my head around that one. But, I forged ahead in the name of French Fridays with Dorie. I bought my whole red snapper (I got the last one!). The nice folks at Whole Foods cleaned, scaled, and chopped it up for me. I made sure they left me the head. When I arrived home, I simmered that snapper, head and all, with a bunch of lovely aromatics, including onions, fennel, saffron, tomatoes, and some herbs and spices. The secret ingredient is pastis, an anise-flavored liqueur. Next, I ran the whole shebang (minus the fish head) through my food mill! It was actually kind of hard work. After adding a little more salt, pepper, and pastis, my soup was ready for serving. 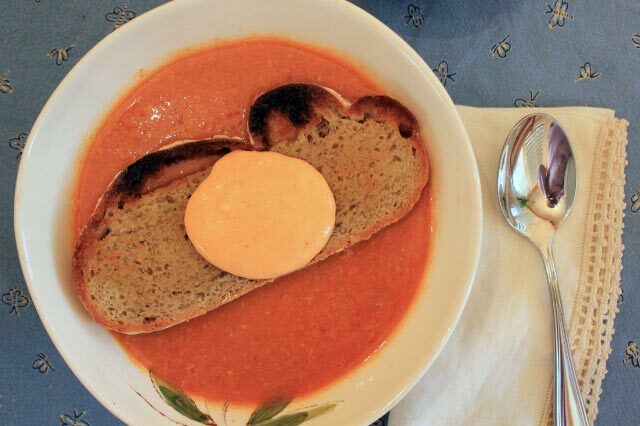 Another important element of this fish soup are the garnishes: a large crouton and rouille. I attempted to make my own rouille (a cousin of aioli) using Dorie’s recipe, but failed miserably. It was looking good. But, at the last minute it it suddenly turned to liquid! Did I add the last bit of olive oil too fast? Who knows? The next day I found this Saffron Rouille recipe using pre-made mayonnaise. It was delish! So, back to the soup. 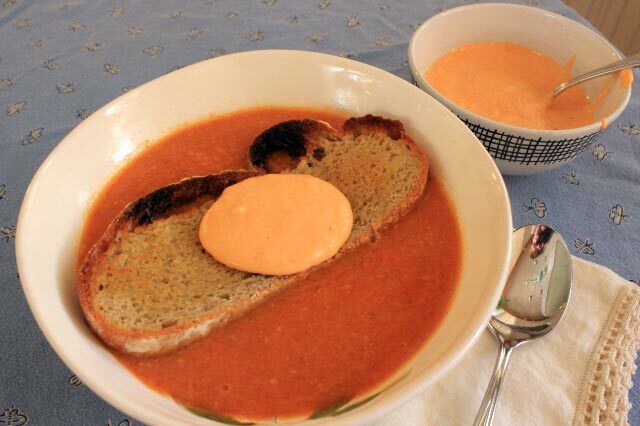 To serve the soup, it is topped with a slice of toasted country bread and a large dollop of the rouille. I have to say, after eating this both with and without the rouille, it really adds a lot to the soup. Don’t skip the rouille! This soup was met with mixed reactions in my house. I loved it! I loved the flavors and textures. It was unique (to me) and delicious. Certain other people couldn’t get past the fact that this was “fish soup”, and didn’t care for it. I probably won’t have a chance to make this soup again because it was a lot of work for just one person to eat it. But if you are looking for a soup to impress a group of fish-liking, adventurous eaters, give this a try! Happy New Year! January 2015 is going to be a fishy month for French Fridays with Dorie, and we’re getting off to a very fishy start with Simplest Breton Fish Soup. 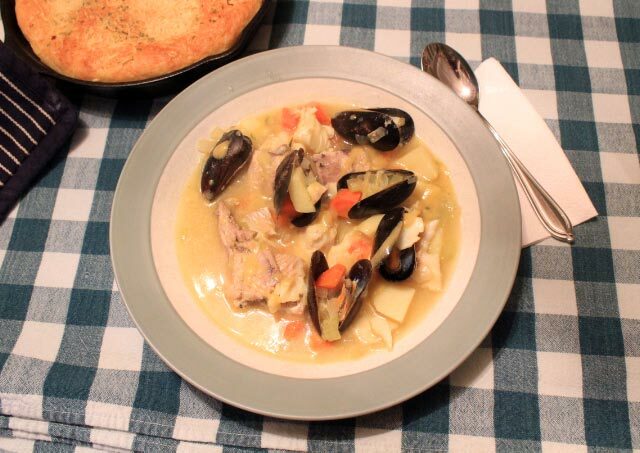 As the name implies, Simplest Breton Fish Soup is a very simple soup, inspired by the soup fishermen in the Breton region of France would make aboard their fishing boats. It’s made with some basic vegetables (onion, shallot, garlic, celery, leek, and potatoes) and whatever fish is fresh. I added carrots and saffron, as suggested by Dorie in her bonne idée. 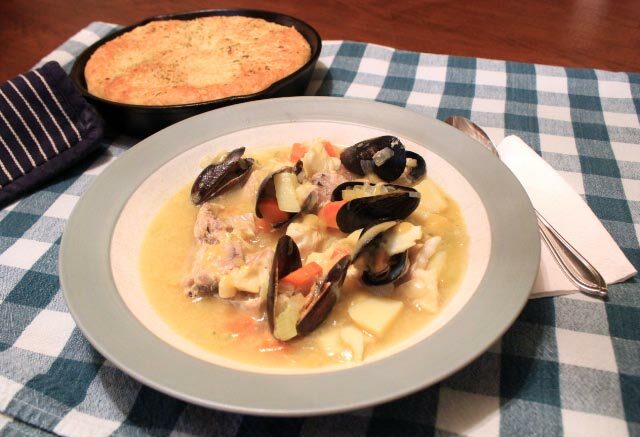 Dorie recommends using a variety of fish and mussels for this soup. I used one sardine, a nice amount of cod, and a handful of mussels. So how did my family like this simple, fishy soup? I loved it! My husband…not so much. I didn’t even try giving any to my daughter. I loved the rustic simplicity and straightforward flavors. It was almost refreshing after the heavy eating of the holidays. Even though I loved this soup, I doubt I will make it again since the rest of my crew would not be on board.